Description: This yarrow is also called Sneezewort. The flower color is white. This plant is a less aggressive garden thug than Achillea millefolium, it does spread by stolons but not invasively. Achillea "The Pearl" prefers full sun and tolerates poor soil. Increase by division or seed. Uses: Cut flowers, dried flowers, boarders. Tips: It will establish itself quickly in the space you provide for it. It can almost become invasive if you don’t take care to cut the plant back during the blooming time. Be sure to cut only when majority of blooms are fully open on the shrub. When you do cut from the pearl you can have a brilliant white bouquet of cut flowers in a vase or an arrangement of dried flowers that keep the brilliant white color exceptionally well. 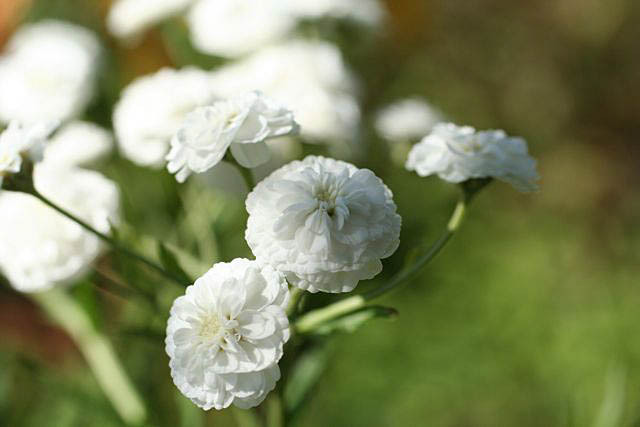 Problems you should look out for when taking care of achillea the pearl would be powdery mildew, leaf rot or root rot. These can be prevented by allowing proper airflow with the plant by cutting it back at proper times and not over watering the plant.